Ever wanted all the fame, cash, and excitement that seems to follow pop stars everywhere they go, but never really fancied yourself as a singer? Click here to play! Well now you can bypass the entire nerve-racking singing process and jump straight into the massive cash payouts in American Icon! Free spins as well as a Bonus game are offered in this 5-reel, 20 pay-line slots game. You will receive 15 free spins when 3 or more Scattered Recording Contracts appear at once, as well as a hefty payout on your stake. 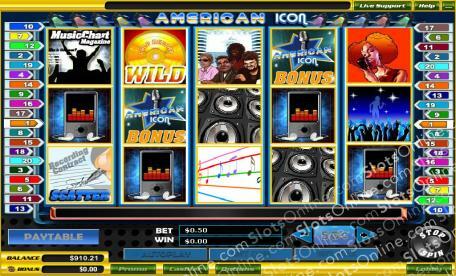 Earn a 10,000 times payout on your initial bet when you land 5 Wild CD Symbols; and if you manage to get 3 American Icon Symbols in one spin you will be allowed to enter the Bonus Round! Once inside it will be up to you to pick to eliminate contestants and negotiate with the judges for a hefty contract. At the end of the Bonus Round you will receive the entire contents of the contract decided upon, and it will be added to you balance. The stage is set, the lights are dimmed, now is your time to prove that you are truly an American Icon! Recording Contracts are Scatter in American Icon. 2 or more scatter symbols anywhere on the reels generate a payout, with 5 paying out at 1000 times you stake. 3 or more Scatters will win you 15 free spins as well. Wild symbols are Gold CDs. Only the highest paid will win per active pay-line, however, if you manage 5 Gold CDs in one spin you will be paid out 10,000 times. 3 American Icon symbols at once will cause you to enter the Bonus Round. Once there you must elimate contestants during 10 rounds. You will be offered contracts at the end of each round, and if you accept one you will leave the Bonus game arena. However, if you play on until the end you must accept the final negotiation. At the end of the game you will be awarded the full amount of your contract.